ABU DHABI, United Arab Emirates – As usual, Zinedine Zidane was calm. His team had not been smooth. But they had done the job, and that’s all that mattered. Unlike their impending final opponents, Gremio, Real Madrid did not need extra time to see off their foes. “We won the game, we did the job, and that’s what matters,” the 45 year old said, sipping a bottle of water to emphasize his state of coolness. 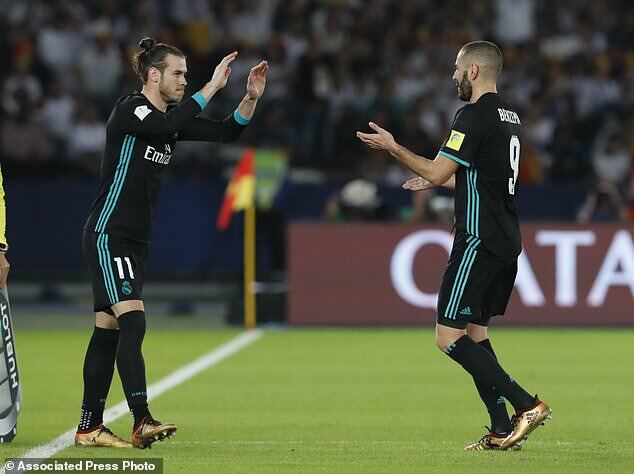 Gareth Bale had come off the bench to score the winning goal as Los Blancos survived a scare to reach the final of the Club World Cup here. To be fair, it had been an odd game, punctuated by officiating decisions. Casemiro had scored and had the goal chalked off as offside by a VAR decision. It was one of 17 Madrid attempts on target. Al Jazira, who qualified for this event as hosts after winning the UAE Pro-League last season, went in at half-time with a surprise lead despite Madrid dominating possession. Romarinho capitalised on a mistake from his Brazilian compatriot Casemiro to score four minutes before the break. But it could have been even better for the manager Henk ten Cate’s side three minutes after the break had the video assistant referee not disallowed a second goal following a swift breakaway, with Mbark Boussoufa adjudged to have been marginally offside. Cristiano Ronaldo made them pay immediately with the equaliser following a fine through ball from Luka Modric and Madrid continued to pile on the pressure as they went in search of a winning goal. That eventually came when Bale converted with his first touch just seconds after replacing Benzema nine minutes from time. Joy Sports filed this instant spot-report, below, right after full-time. Reporters, seeing the chance to flay Karim Benzema in a back-handed way, quizzed the coach of Spanish giants about how poor the striker had been on the day. “[Benzema] has been very good and I will not ask for a striker,” Zidane said, in reference to increasing talk that he would sell off the player in the coming transfer window. “Everyone can have their opinion, he had a good game [today]. The team have created chances and I’m disappointed for him because the ball didn’t want to go in. But Madrid fans Joy Sports spoke to after the game were not enthused. For many, Benzema, with five goals in 17 games, has to improve on his conversation rate – a Real Madrid striker cannot be so wasteful. And with his French compatriot already revealing his desire to strengthen the squad when the winter window opens, names linked to the club have included Tottenham’s Harry Kane or Inter Milan’s Mauro Icardi. Zidane should be worried about how lukewarm his side can be, slaying Villareal, 5-0, with gusto only last week and now struggling to bury the tactically coiled UAE champs on Wednesday. Madrid are fourth on the La Liga league, eight points behind Barcelona. By the time they return to domestic action a week on Saturday, Barcelona – who face Deportivo while Madrid are here in the UAE – could be out of sight. There is also the small matter of El Clasico on Saturday, December 23 in Madrid. Zidane will need all the ice on offer to keep as calm as he was at the presser after beating Al Jazira.